WordPress Download Manager Directory Add-on will help WordPress Download Manager users to show all categories and downloads on a single page with different styles. 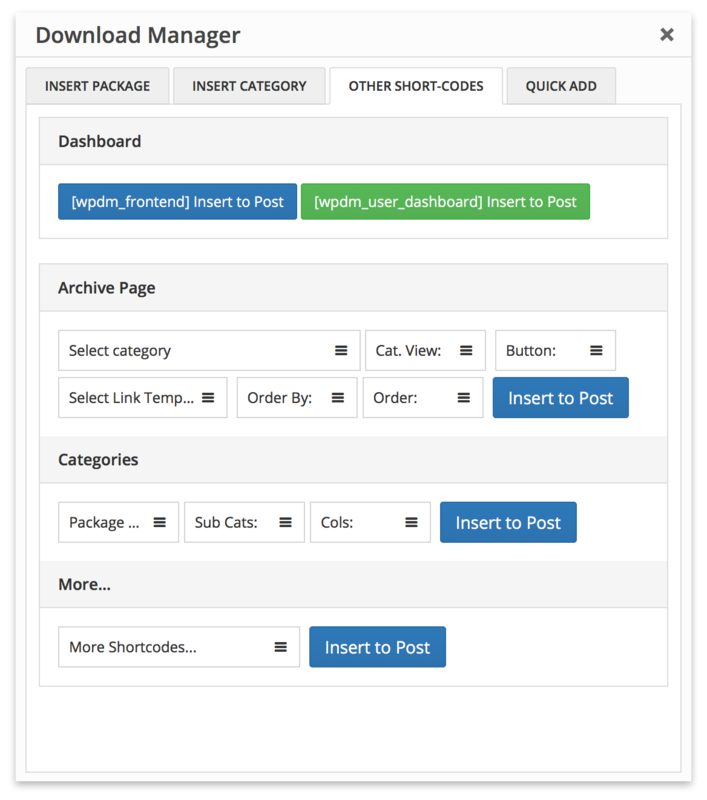 Upload/Install from Admin Menu Plugins Add New Upload, Just the same way as other WordPress plugins. — login: 1, use this parameter if you want to make the shortcode members only / login protected. Otherwise, you may skip this parameter. additionally, there is a search box widget for searching downloads. Create a dir named download-manager inside your active theme directory if it is already not there. New! Added new shortcode parameter login=1 , in case, you want to make the page login protected. Is the Directory add-on included in the All Add-Ons pack? I did not see it listed in the discription. hi, can i use WPDM Directory Add-on in the free version of the wdm? wheere is the demo of this plugin? Is there shortcode for the examples given in the demo? please download and install this add-on https://www.wpdownloadmanager.com/download/advanced-tinymce-button/ , you can generate all short-code using that add-on, as soon as you install any new wpdm add-on, the new short-code option will be hooked with wpdm tinymce button add-on automatically. hi, you can go any do a search for tags associated with the file as well as searching by name? Thanks. you need to upgrade your server php version to 5.4+. Thanks net9design. I solved it by changing the code because I did not want to upgrade my version to avoid errors that can cause an update. you do not see the files of the second language, instead WPDM-downloads-all he did. How to fix it? How do you update the paid version of this plugin? I see the announcement that 2.6 is available but just takes you to wpdm home page. You simply need to download it again from your orders page ( https://www.wpdownloadmanager.com/purchases/ ) to get the latest version. How can i show nested folder structures? I want to see the subfolders of the folder when I click on it and then in the subfolders there are the files. thanks for the quick response: when i add “[wpdm_tree]” to any page. nothing will show up in the frontend. the extended short-code add-on is enabled. is there any setting i need to set when i want to use [wpdm_tree]? Actually I don´t want the functionality as it´s in the [wpdm_tree] example. I want a list of all categories and when i click on a category i want to see the subcategories without the parent once. and if i click on a subcategory i want to see the files which are in that subcategory. Is there a way to turn off the default list and just have the category buttons until someone clicks one? Not yet, but noted for implementation. Is it possible that when you click a category the list that appears respects the order by you put into the shortcode? Sorry, no, it will take the order parameter from the dropdown next to search box. Please update plugin, now you will be able to select category view too, also updated usage in the description above too. Hi, How can I change the default display to ASC instead of DESC? Even if I use order=”asc” in the shortcode it still defaults to descending order. Use tinymce button to insert shortcode. There might be some error in your shortcode. 1) Is it possible to hide/remove the two ‘Order By’ columns in the Compact layout? I do not want to have that functionality. 2) Can I rename ‘Packages’ to ‘Downloads’ anywhere? 3) For some reason, subcategories are displaying beneath a particular main category when using the Compact layout. I do not want them to show. Could this be because they are three levels down (main>secondary>third)? I just noticed that all of my subcategories are listed. Can I change this at all? Hi, it seems like the shortcode doesn’t totally work in a text widget? Is it possible to hide the number count next to each category? Massive problem…. using this addon however url /?wpdmtask=get_downloads&pg=4626&category=&cp=26 renders an un-styled page where all protected files are downloadable without being logged in / or having the correct access. Please help… i can email you the link and admin login in private… dont want to share here for privacy reasons! please HELP… my client is losing their mind and may get sued becuase of this!! We shall add rel="noindex nofollow" attr with the next update, please use support forum https://www.wpdownloadmanager.com/support/forum/download-manager-pro/ for faster response. The parameter cat_view isn’t showing up in the shortcode listed in the “usage” section on this page. How do I set the menu structure to be Archive Page Sidebar? Nevermind! Downloaded the TinyMCE button that solved it! Hi, is it possible to make an advance search also by tags and not only by category? Sorry, not yet. But it is in our to do list. seem not working in my theme. I have the filters but no content. Hello! Do you think it’s possible to do something like this (http://www.intelbras.com.br/downloads) with WP Downloads Manager? What is the demo that is more similar do this, and what should I buy to accomplish this? Another question: If I buy the All Addons Pack for unlimited sites, do I need to buy the Developers License for the main plugin? Probably you are looking for this: https://www.wpdownloadmanager.com/download/wpdm-accordion/. Yes, you will need developer license for both, main plugin and all add-ons pack to use with unlimited sites. Is posible hide the all files list and only show files when the user clic on a especific category? I need to exclude categories, how can i do ? But the Advanced TinyMCE Button Add-on does not display in the Pro themes page editor. All price options are billed yearly. You may cancel your subscription at any time. View terms.